In Chinese and other East Asian societies, a red envelope or red packet (known as Hóng Bāo in Mandarin, Ang Pao in Taiwanese Hokkien and Lai See in Cantonese, and "lì xì" in Vietnamese) is a monetary gift which is given during holidays or special occasions. Red envelopes are mainly presented at social and family gatherings such as weddings or on holidays such as the Lunar New Year. The red color of the envelope symbolizes good luck and is supposed to ward off evil spirits. The act of requesting for red packets is normally called (Mandarin): 討紅包, 要利是. (Cantonese):逗利是. A married person would not turn down such request as it would mean that he or she would be "out of luck" in the new year. In keeping with Chinese customs, newly wedded couples are also usually expected to be extremely generous with the amount offered in the red packets, so as to receive blessings for a blissful marriage. The amount of money contained in the envelope usually ends with an even digit, in accordance with Chinese beliefs; for instance 88 and 168 are both lucky numbers, as odd-numbered money gifts are traditionally associated with funerals. But there is a widespread tradition that money should not be given in fours, or the number four should not appear in the amount, as the pronunciation of the word "four" resembles that of the word "death", and it signifies bad luck for many Chinese (See Numbers in Chinese culture). At weddings, the amount offered is usually intended to cover the cost of the attendees as well as a goodwill to the newly weds. During Lunar New Year, mainly in South China, red envelopes (in the North, just money without any cover) are typically given to the unmarried by the married. The amount of money is usually a single note to avoid heavy coins, and to make it difficult to judge the amount inside before opening. It is traditional to put brand new notes inside red envelopes. In recent years, banks also provide newish-looking notes to reduce the environmental impact of printing new banknotes. In Vietnam, lì xì are typically given to those who are younger as long as they are bachelors. There are no clear literary sources from which to trace the origin of the red envelope tradition. In China, during the Qing Dynasty, the elderly would thread coins with a red string. The money was called yāsuì qián (traditional Chinese: 壓歲錢 压岁钱), meaning "money warding off evil spirits", and was believed to protect the elderly from sickness and death. The yāsuì qián was replaced by red envelopes when printing presses became more common. Red envelopes are also referred to as yāsuì qián. Similar customs also exist in other countries in Asia. In Vietnam, red envelopes are called lì xì (similar to the Cantonese pronunciation "lai see") or, in some cases, phong bao mừng tuổi (happy new age envelope). In Thailand, they are known as ang pow (the pronunciation of the Chinese characters for "red envelope" in the Hokkien/Fukien dialect) or tae ea among the Chinese-Thai. In Myanmar (Burma), the Burmese Chinese refer to them as an-pao (Burmese: ), and South Korea's envelopes are called "sae bae ton" and the envelopes are white, not red. In Japan, a monetary gift called otoshidama is given to children by their relatives during the New Year period. However, white envelopes are used instead, with the name of the receiver written on its obverse. A similar practice is observed for Japanese weddings, but the envelope is folded rather than sealed, and decorated with an elaborate bow. In the Philippines, Chinese Filipinos exchange ang pao (from the Hokkien pronunciation, as most Chinese in the Philippines are of Hokkien descent) during the Chinese New Year. 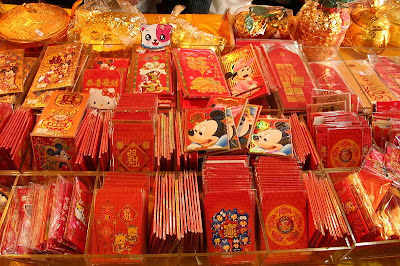 For non-Chinese Filipinos, ang pao is an easily recogniseable symbol of the Lunar New Year holiday and in some places, the envelopes are also appropriated by non-Chinese in giving monetary gifts on other occasions such as Christmas and birthdays. The Malay Muslims in Malaysia, Brunei and Singapore have adapted the Chinese custom of handing out red packets as part of their Eid ul-Fitr("Hari Raya Aidilfitri" in the Malay language) celebrations by issuing token gifts of money in green packets to family and friends. The reason behind the green color is its association with Islam, and the adaptation of the custom is based on the obligatory Islamic duty of zakat (charity) that requires Muslims to provide at least 2.5% of their income to the needy. like all the envelopes you have shared...I appreciate you share it.Gift Card envelopes.